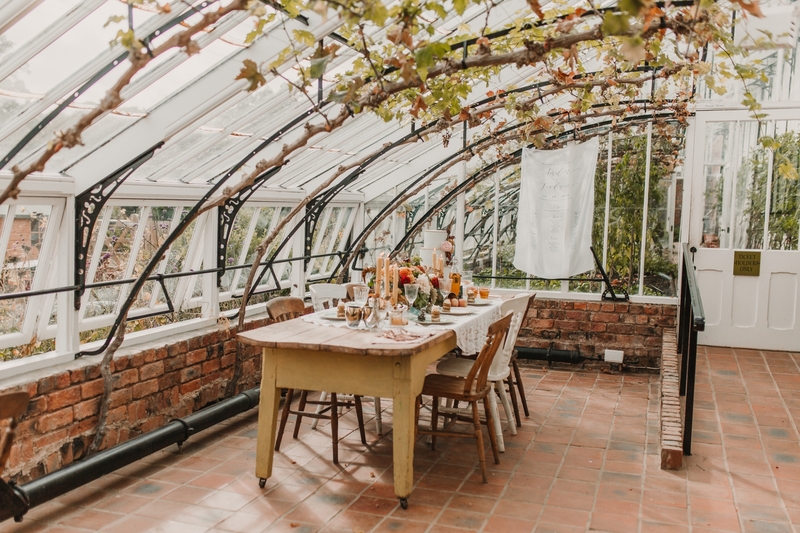 Built in 1759, Helmsley Walled Garden is based in the market town of Helmsley close to York. 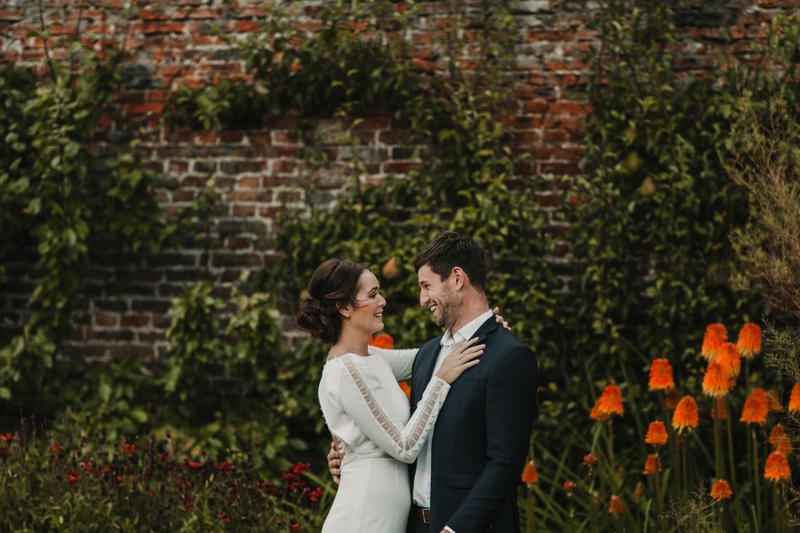 With the Helmsley Castle ruins in the background, it provides an amazing wedding setting. 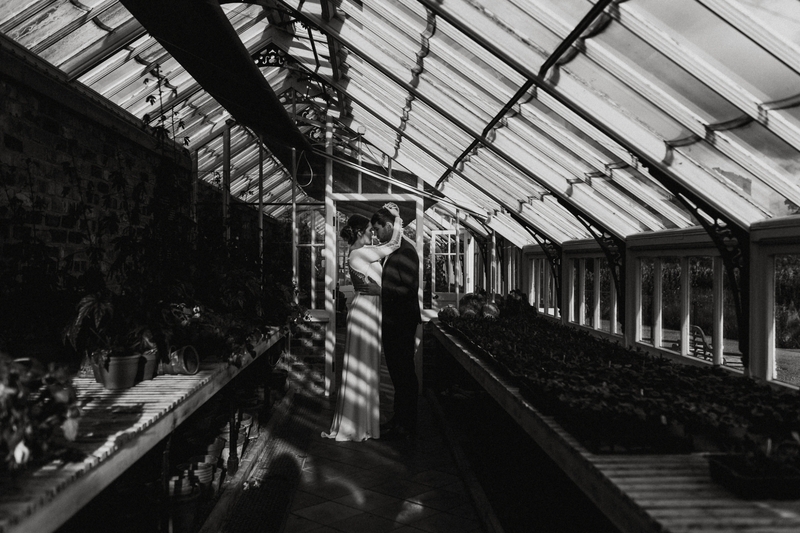 There are seasonal flowers, fruits and vegetables planted throughout the gardens. 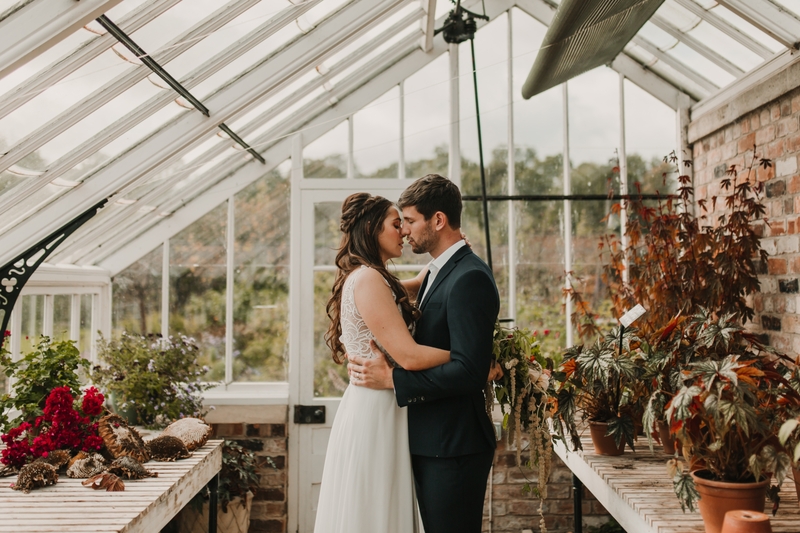 Additionally, there is access to green houses full of botanicals and colour which make it an incredibly beautiful setting for portraits. 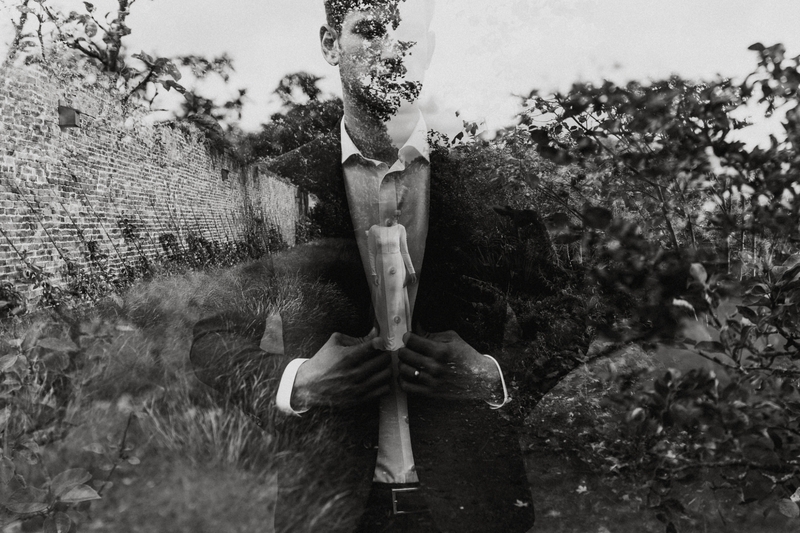 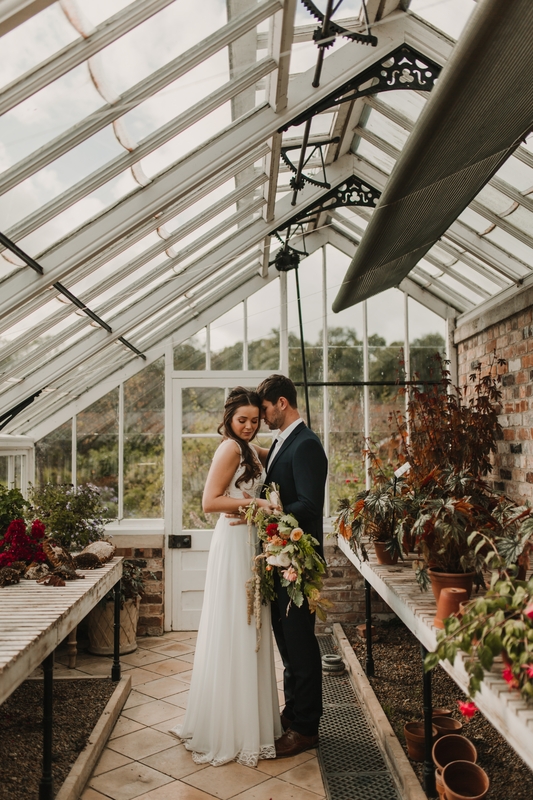 The styling and brief for the shoot is designed around the Helmsley Walled Garden itself. 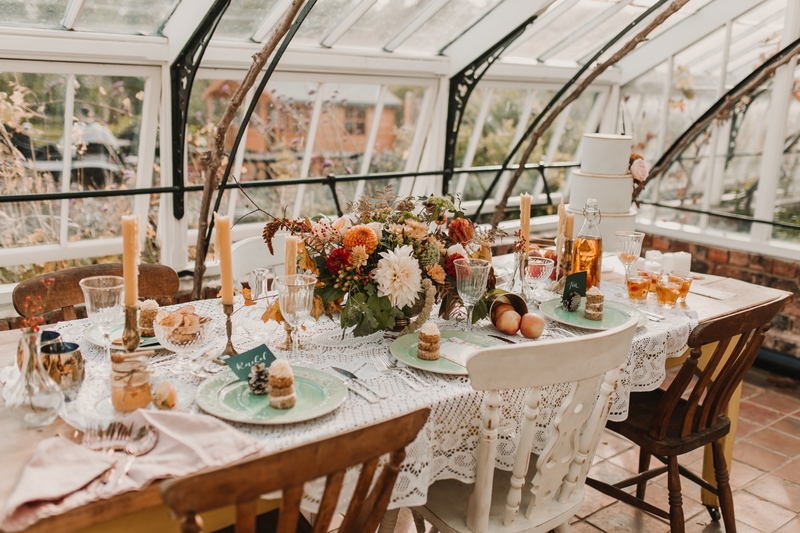 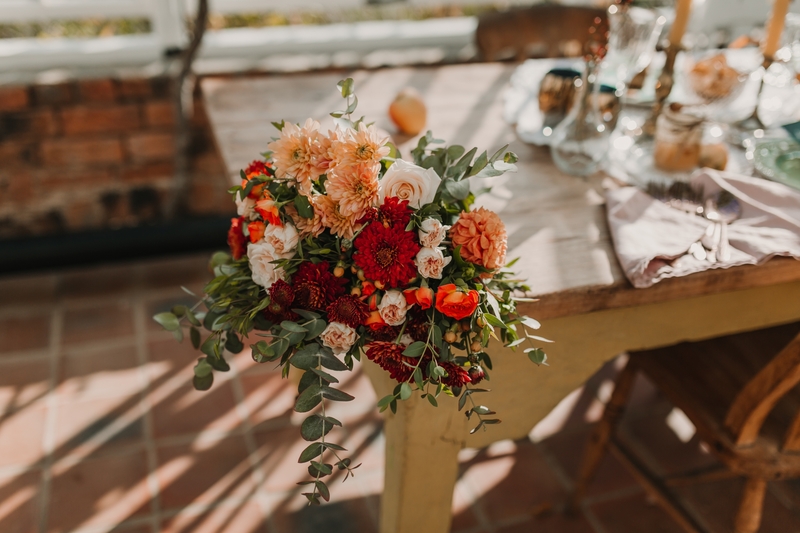 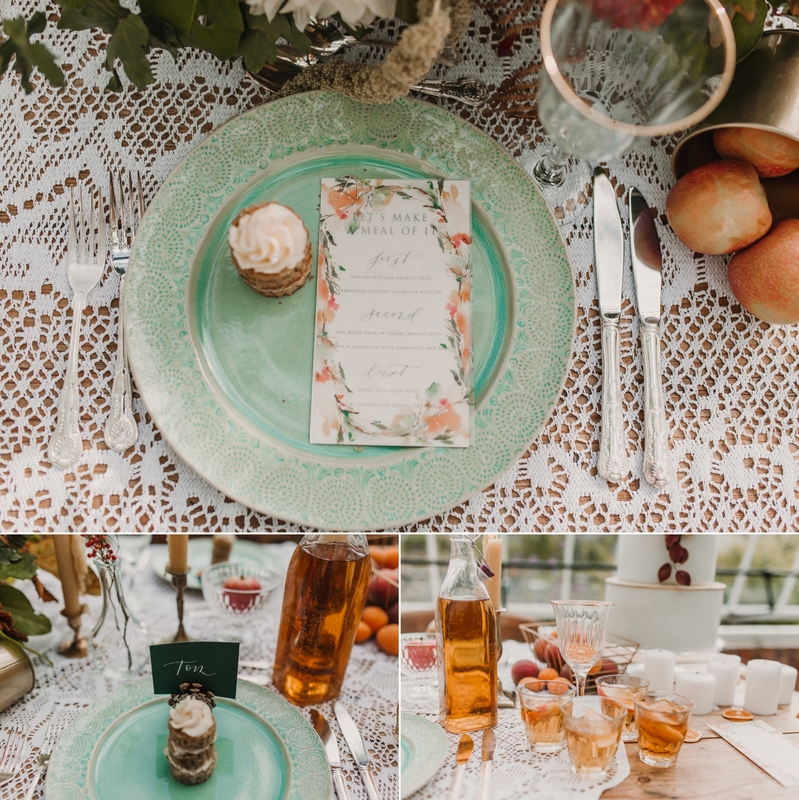 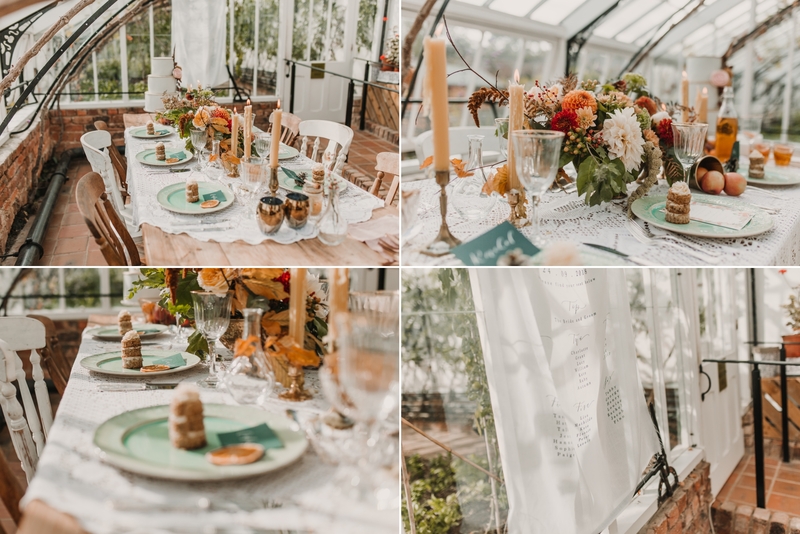 The colour palette of the florals and styling was created by Redamancy and Styling Farm to compliment the existing colours of the greenhouse interiors. 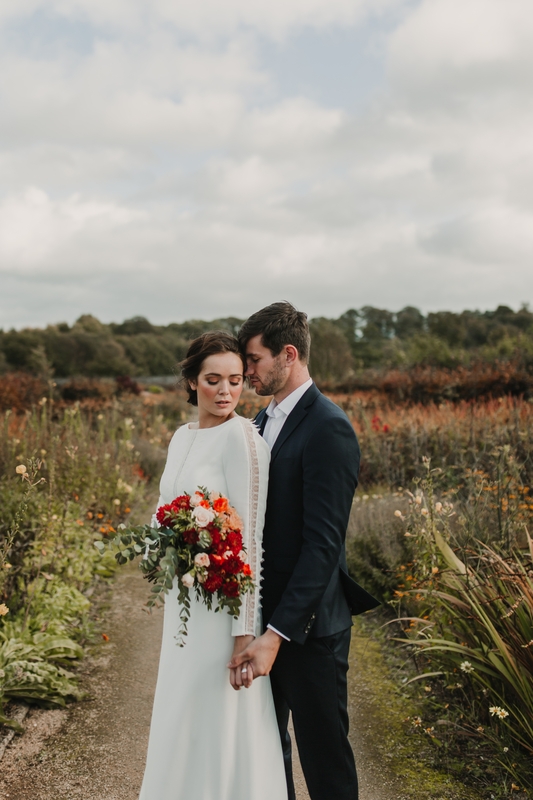 The colour palette was crafted around autumnal colours – in particular reds, yellows and golds. 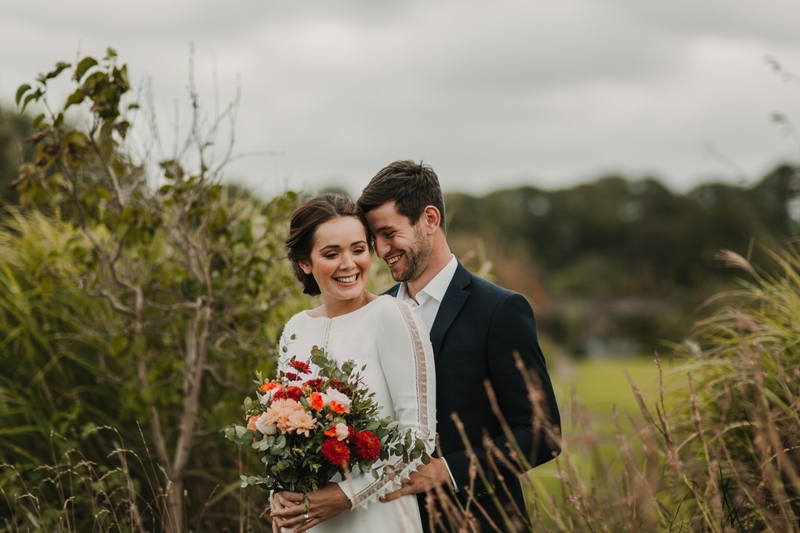 The brief for the hair and make-up had to be flexible due to the windy weather. 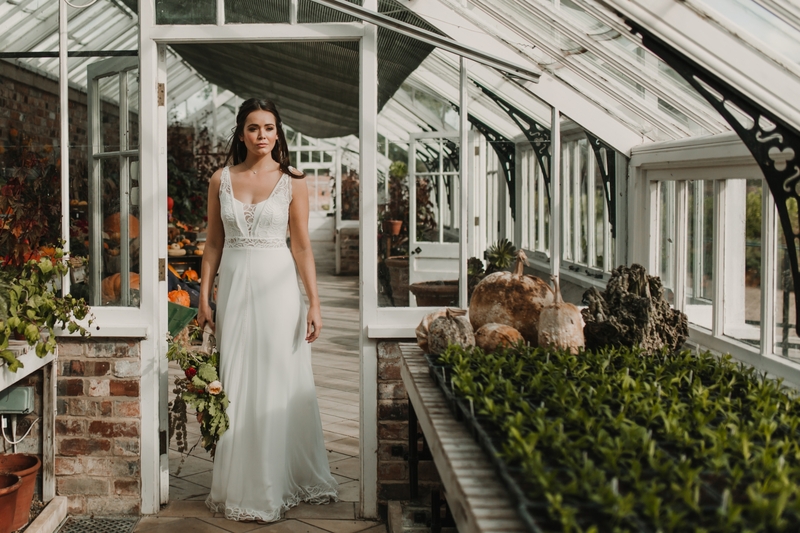 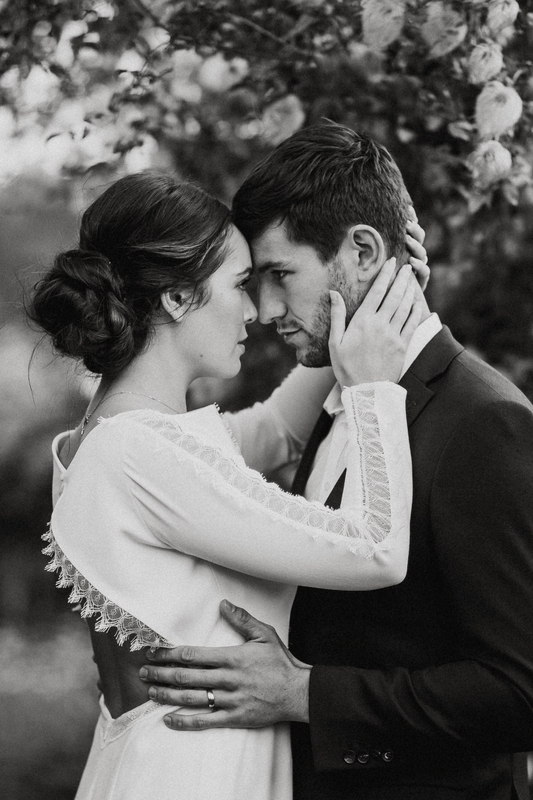 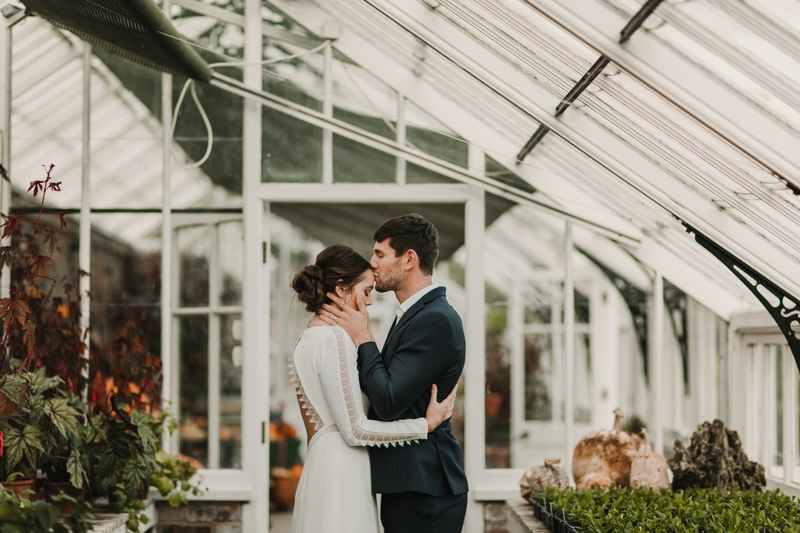 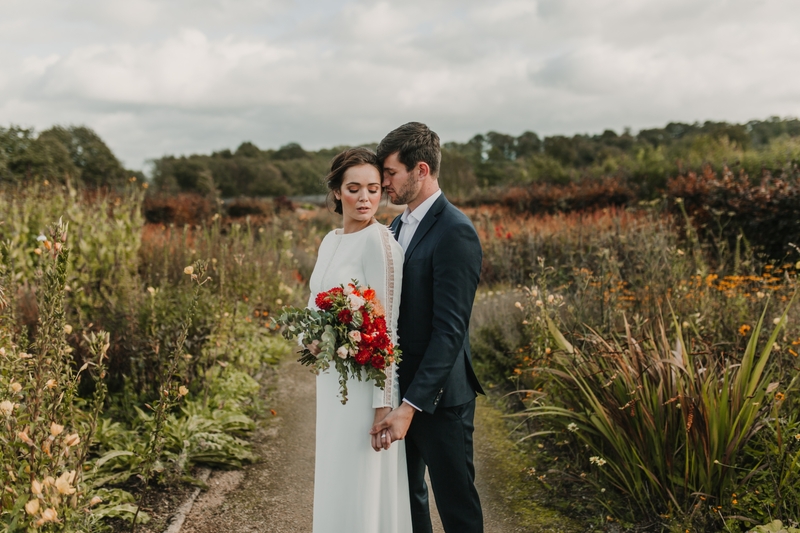 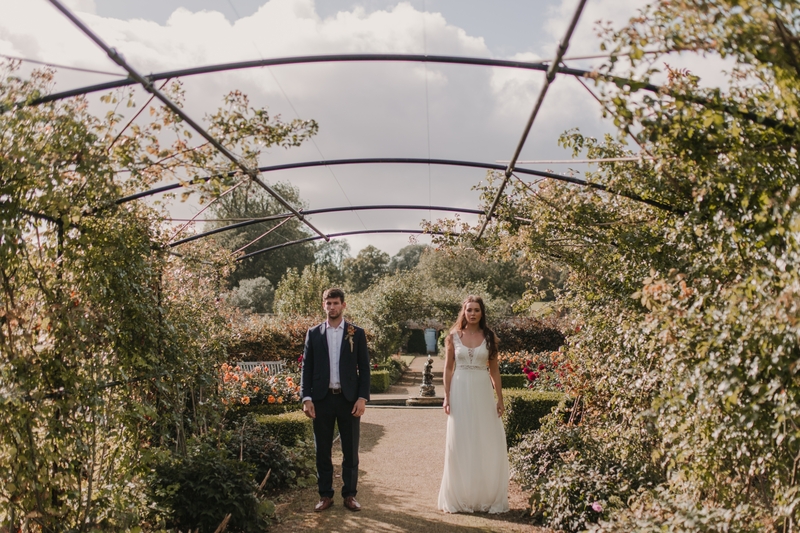 Joanna from Belle & Bride crafted two looks – one for inside the greenhouses and the other for when we shot in the gardens of Helmsley Walled Garden. 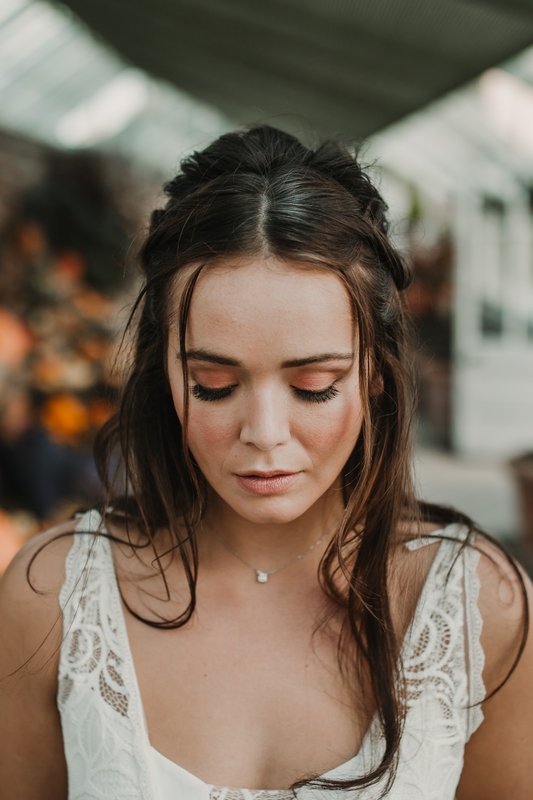 Amy George was briefed to use natural tones in the bride’s make up with accents of colour. 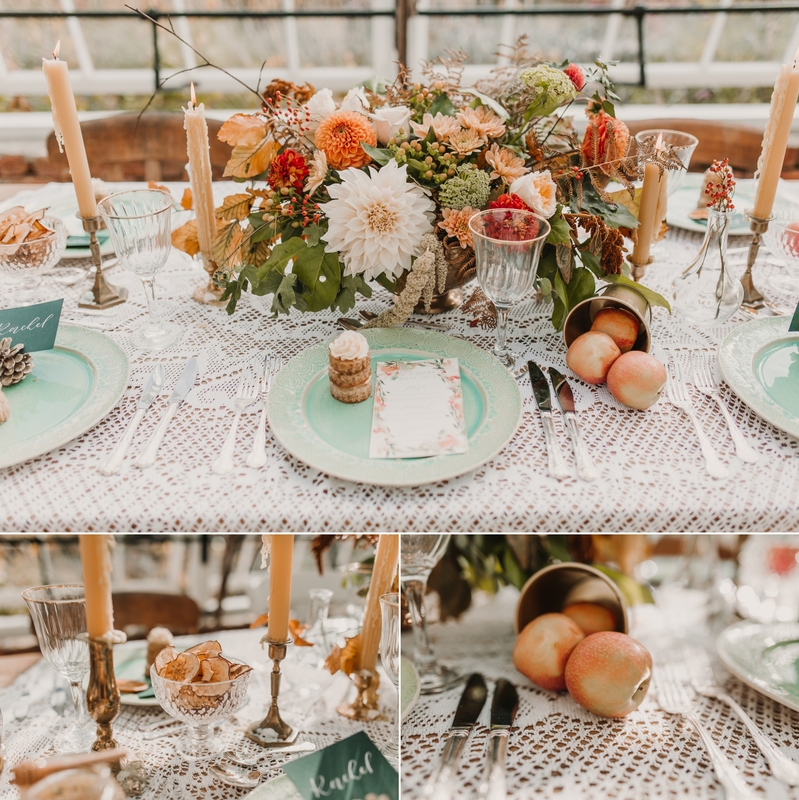 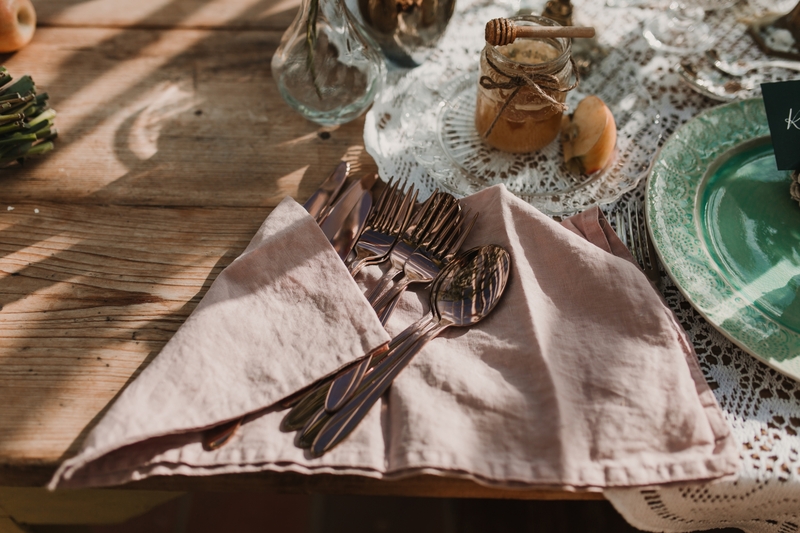 Charlotte from Redamancy brought out the colour palette in the carefully crafted details on the table. 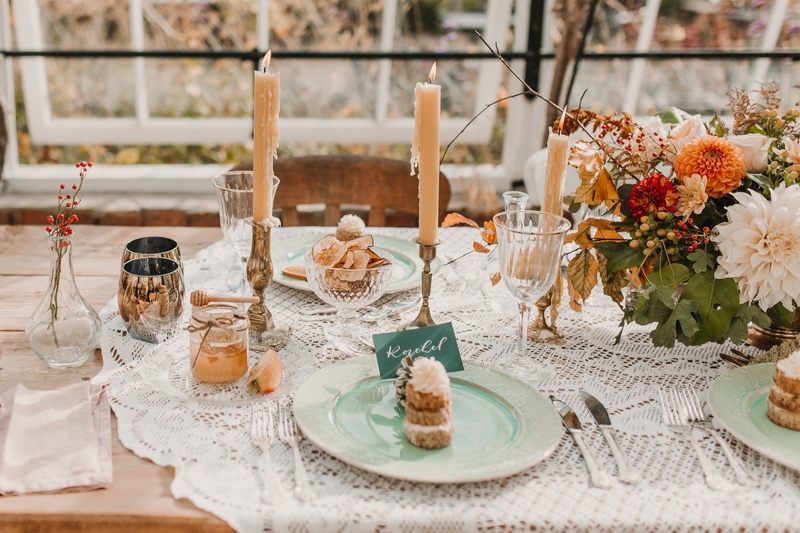 This included: beewax yellow candles, gold edged cups and green plates from anthropologie. 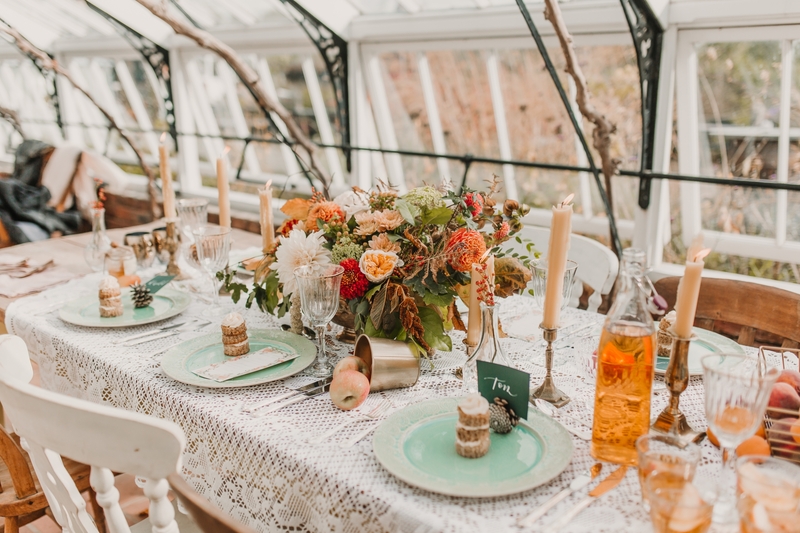 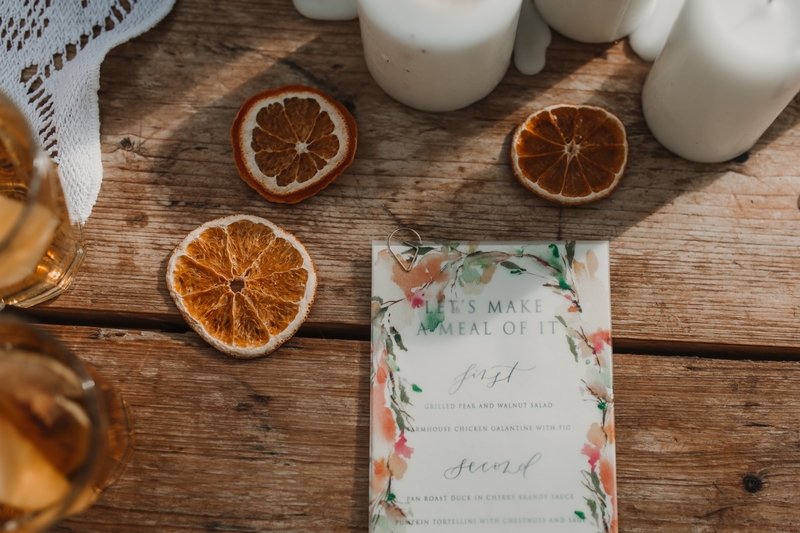 Willow Beau designed the stationery which again fit perfectly with the setting and colour palette. 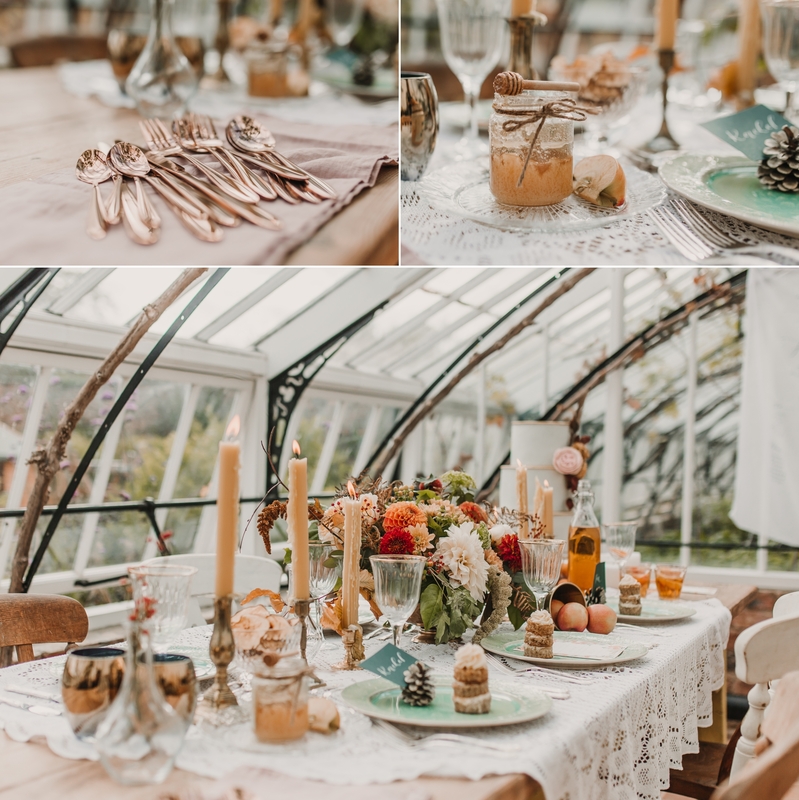 The whole ensemble produced a rustic luxe effect, amazing inspiration for couples wanting a garden wedding or an intimate setting. 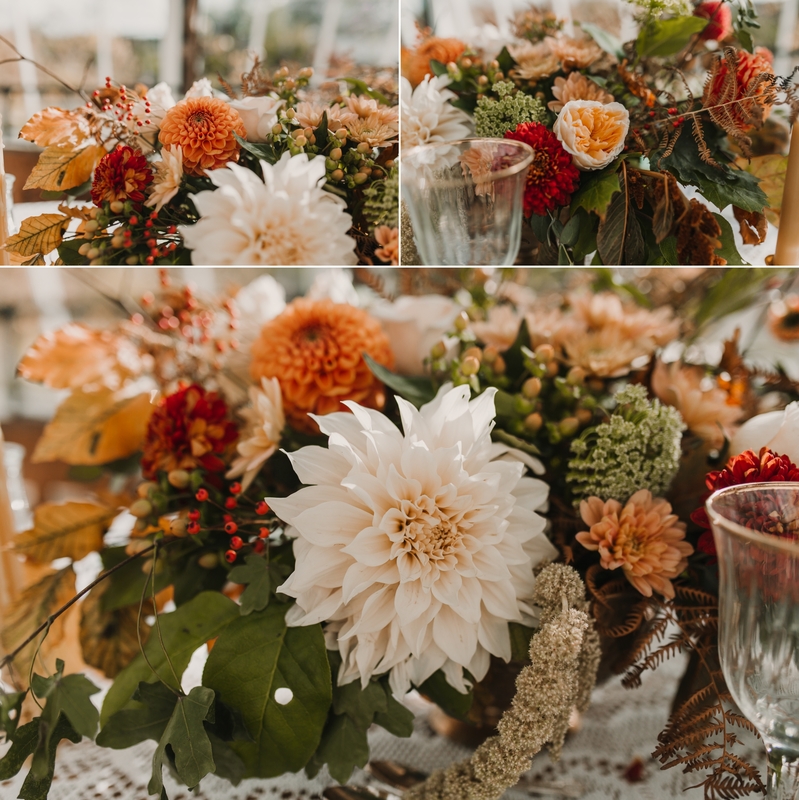 Sarah from Styling Farm produced two amazing pieces for the florals. 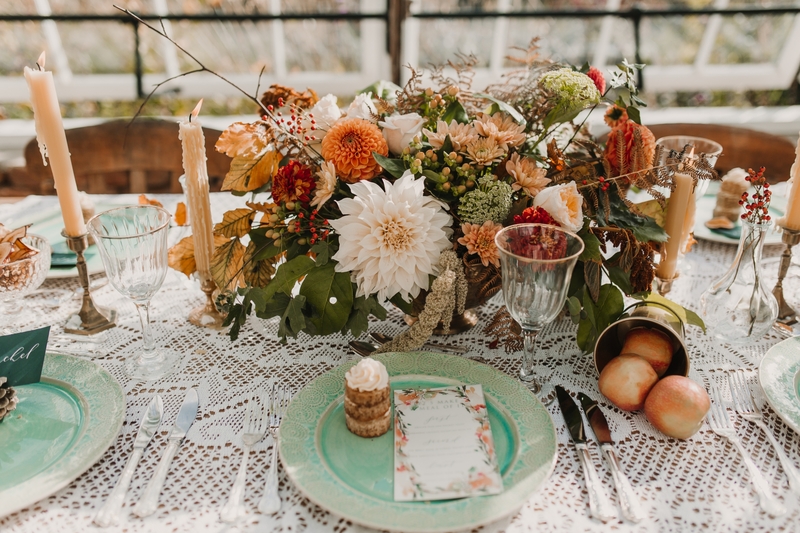 The flowers on the tables further added to the table scape and brought the whole effect together. 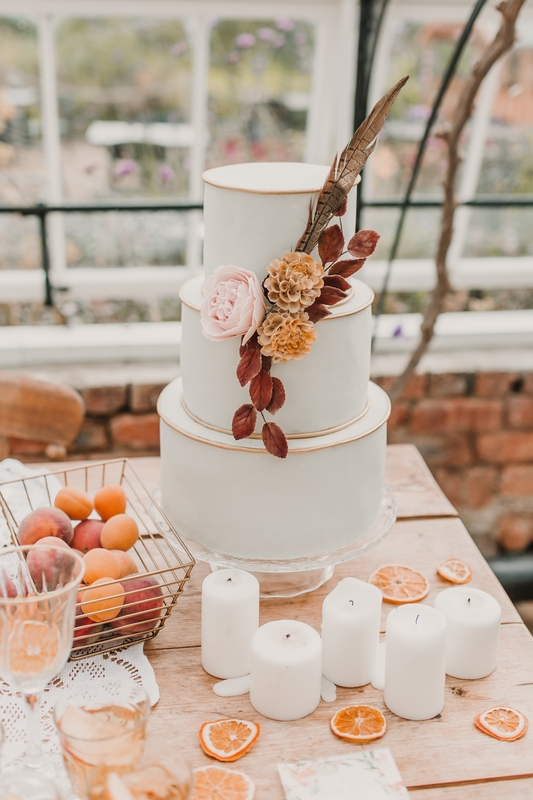 Jo from White Rose Cake Design also created the perfect autumnal cake, with creams for the base cake and red sugar work on the floral decorations. 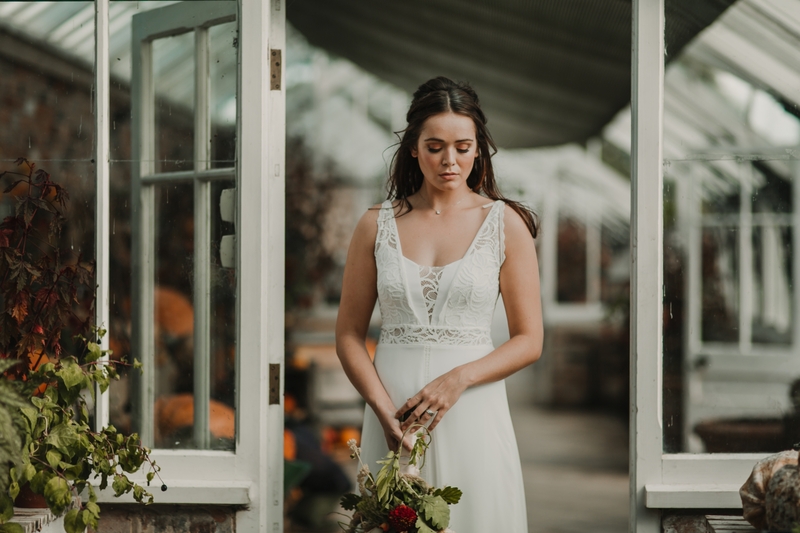 Finally, a note on the dress from Lace & Co. 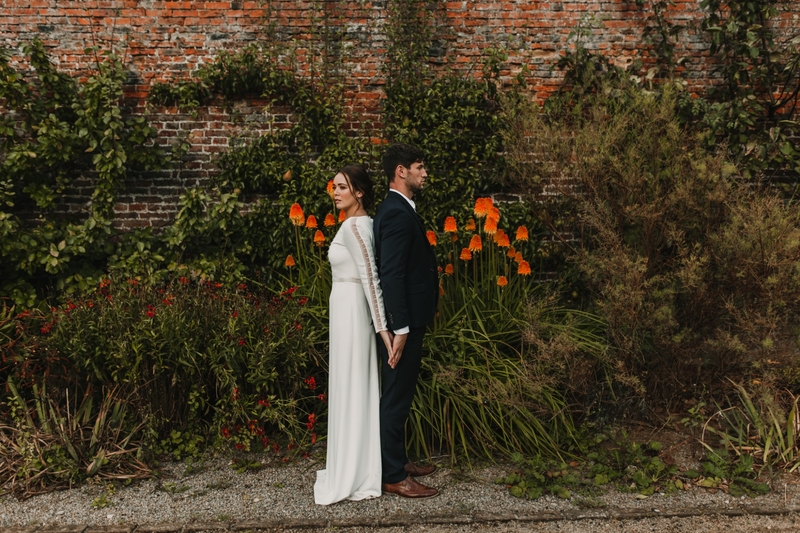 The boho elegant look was perfect for this shoot, simple design with patterned sleeves. 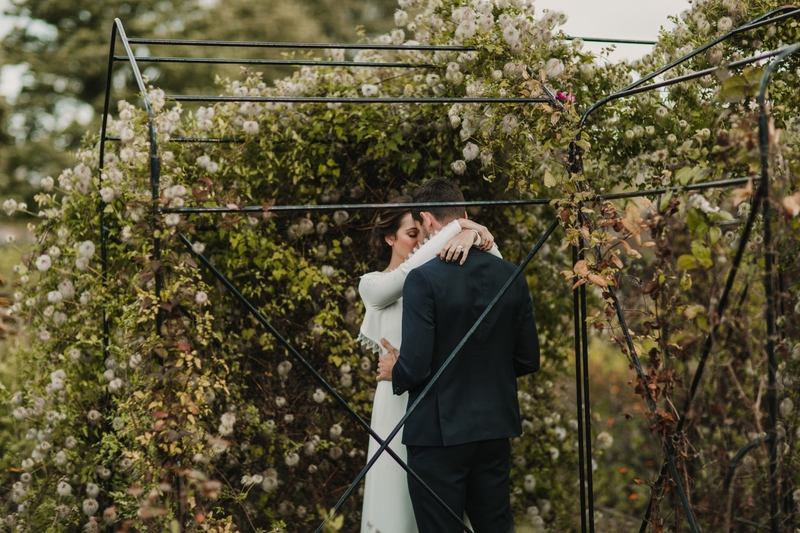 The dress was easy to move in but still so beautiful and elegant. 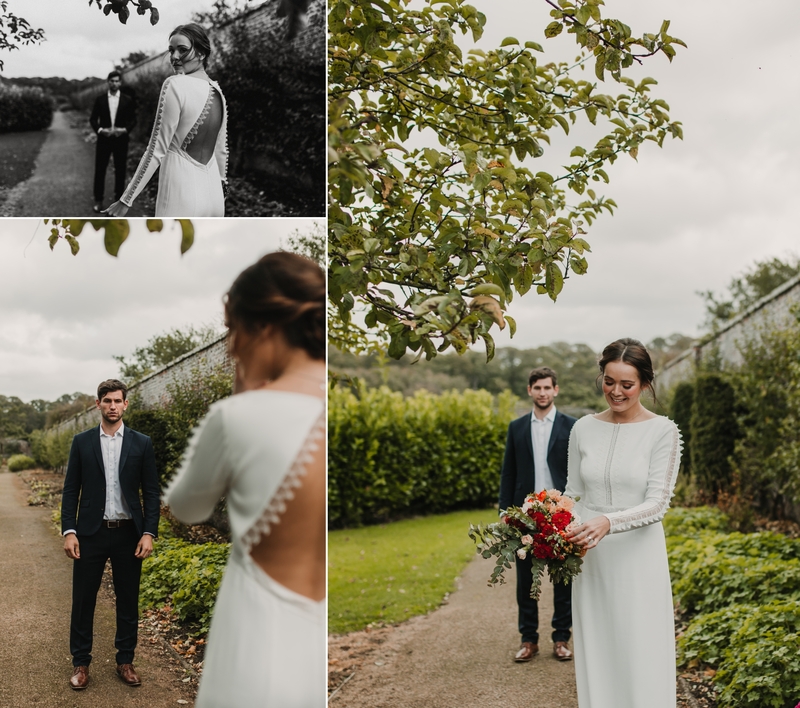 Rembo styling dresses are some of my absolute favourites and this one was no different. 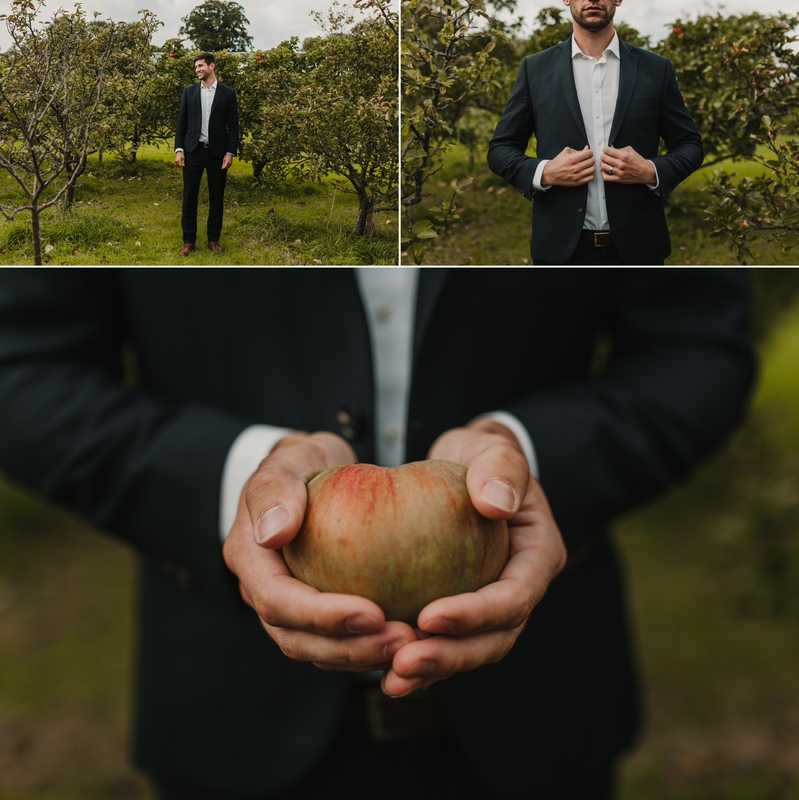 I absolutely loved photographing this shoot. 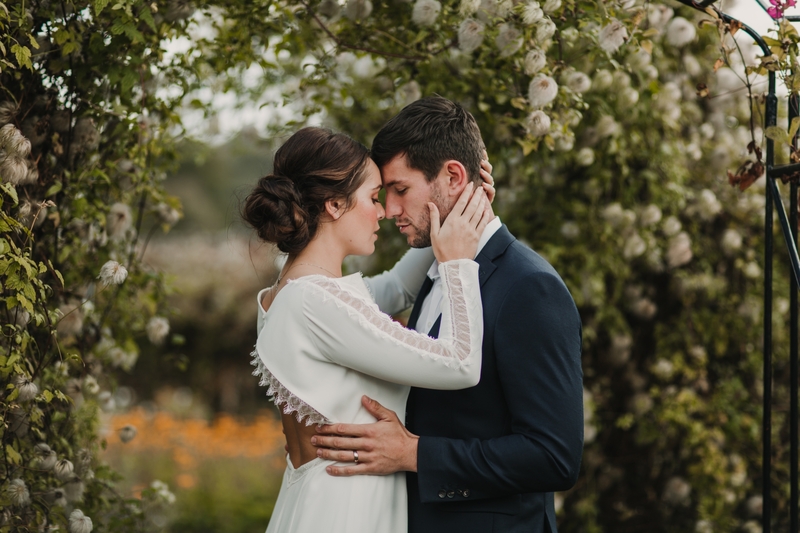 Specificially, I enjoyed building up a connection with Ben and Maryanne. 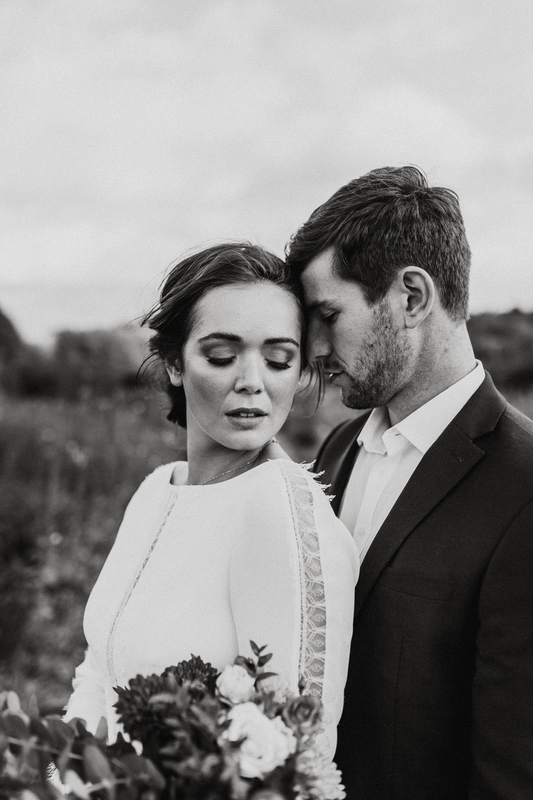 Because of this, I could create beautiful portraits that feel intimate but still natural. 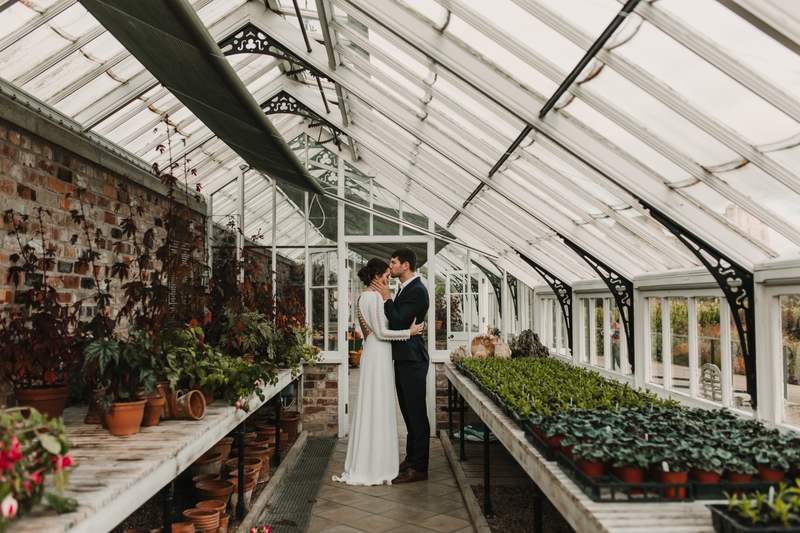 It was absolutely the perfect day at Helmsley Walled Garden and I am looking forward to shooting there again soon. 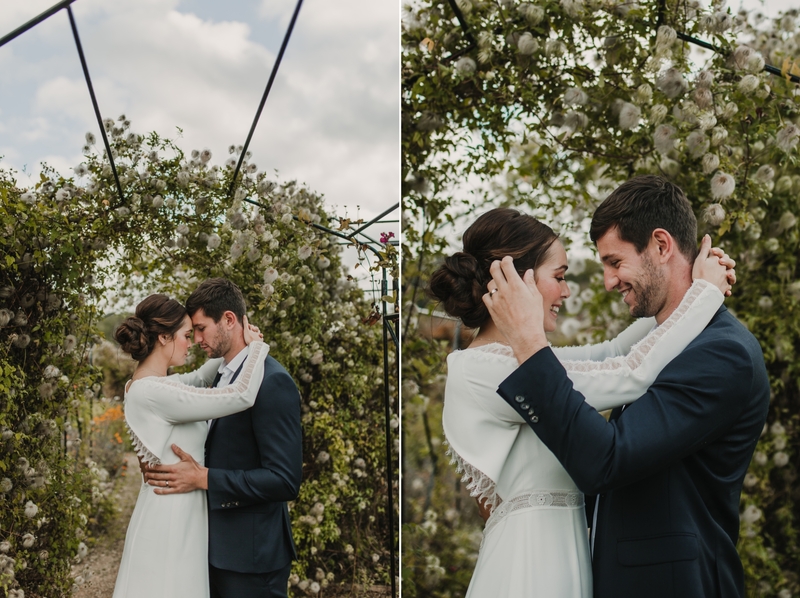 Bride’s Dress: Rembo Styling from Lace & Co. 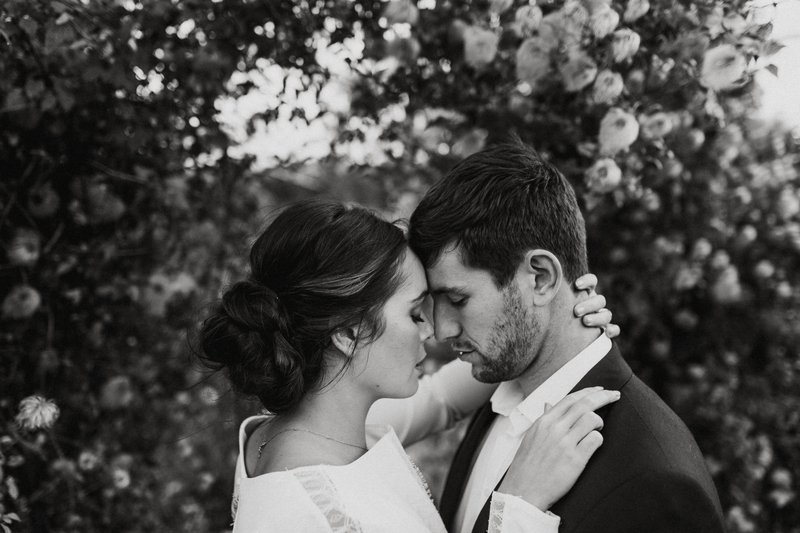 If you are looking for a wedding photographer in the York area, don’t hesitate to get in touch.